So you might be wondering: am I really gonna put zombie to ride a horse while running from an armored car in a partially destroyed city that I put in this chaotic state myself? Be the patient zero in an outbreak! Terrorize the city, scare everyone to death and eat their brains if you want to. Learn new skills from the brains you eat and evolve to accomplish what no zombie has ever dreamed before! Just don’t forget to start a zombie apocalypse in the process. Go in an unthinkable quest for the zombie cure! Learn, evolve, survive, laugh and please have a massive load of fun! Have you ever asked yourself whether all those ugly raging zombies you kill, might actually have some sort of feelings? In John, The Zombie, the player gets in the role of John: a mad scientist who, in a desperate research into bringing dead people back to life, ends up turning himself into a zombie by accident. The game starts at the very beginning of John’s quest for the cure. Though, for that, he’s gonna have to learn how to be a human again. 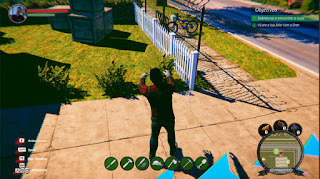 As the player progress in the search for the cure, the zombie gets new skills. From basic locomotion, like running, jumping and cycling, to the point of driving cars and trucks. 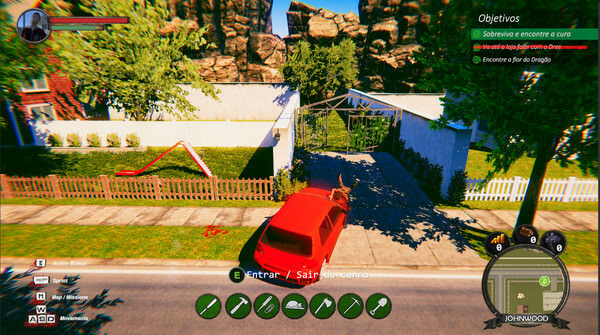 John, The Zombie is an open world game set in a fictional city. Although the game has a questline to be followed, it’s possible to walk freely through the city. There a many skills to be learned throughout the game and each one of them will allow the zombie to perform more activities (and give you more ways to terrorize the poor people from Johnwood). The only thing that doesn’t change is: John needs to eat brains!